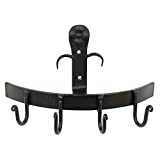 These multi hook wall brackets are great for keeping garden tools handy and dry, but you can find a multitude of other uses to reduce clutter in the kitchen, basement hall or pantry. Use them to store brooms, mugs, kitchen utensils, aprons, shopping bags, your grubby gardening togs and more! Available in compact four-hook, and longer, five-hook options.